I don’t like ginger at all, except Mango ginger/Maa inji. I tasted them only once and was amazed by its taste. No smell of ginger at all,not even 1%. It was tasting like mango,only that its crunchiness,texture was like ginger! I never got a chance to make this maa inji uruguai before. Last weekend got this pack of mango ginger in Mustafa and without second thought bought it. My hubby asked to make pickle out of it,so called my mom to get the recipe. It was very very simple. Peel the skin of the ginger using a peeler,wash it and pat dry. Chop it according to your wish,my mom slices into circles,easier way…but I chopped them finely…so its your choice. Take this in a bowl and squeeze the lemon and add salt and chopped green chillies. Mix well. Season with the items given under ‘To temper’ table,mix well and store in an airtight container in the fridge. Use after a day or two. The pickle tend to leave water after we add salt. You can add finely chopped capsicum also in this same recipe.Also try adding all the veggies like carrot,cabbage,cucumber to make vegetable pickle. Hey Raks..this is a very simple recipe!I am not very fond of ginger too! Raks, where did you get this in Singapore??? Looks super tongue tickling….perfect with curd rice. This recipe sounds easy…. Oh my god, that looks super tounge tickling pickle indeed..great recipe..would love to try this out sometime soon..thanks for sharing! happy Tamil newyear to u and ur loved ones!! I too make the same way and its my hubby's fav. WE have to be careful last when I brought in Little India it had turmeric mix too. Simple yet loved by everyone. Looks very tasty, and is easy too….good one! This is our veryyyyyyyyyyy fav one Raji.. I am getting here very rarely though still missing this very very much. Love it a lot and i am drooling. Tamizh Puthaandu Vazhthukkal for everyone Raji. We make this is in a similar way and I just posted on my blog. I love them with curd rice. Tongue tickling n drool worthy pickle- great flavors! Simple and delicious pickle.Well presented. The way you cut it makes it appear as mango cubes and my mouth is watering. BTW, how longer this stays fresh? We prepare it in a different way to store it for longer. 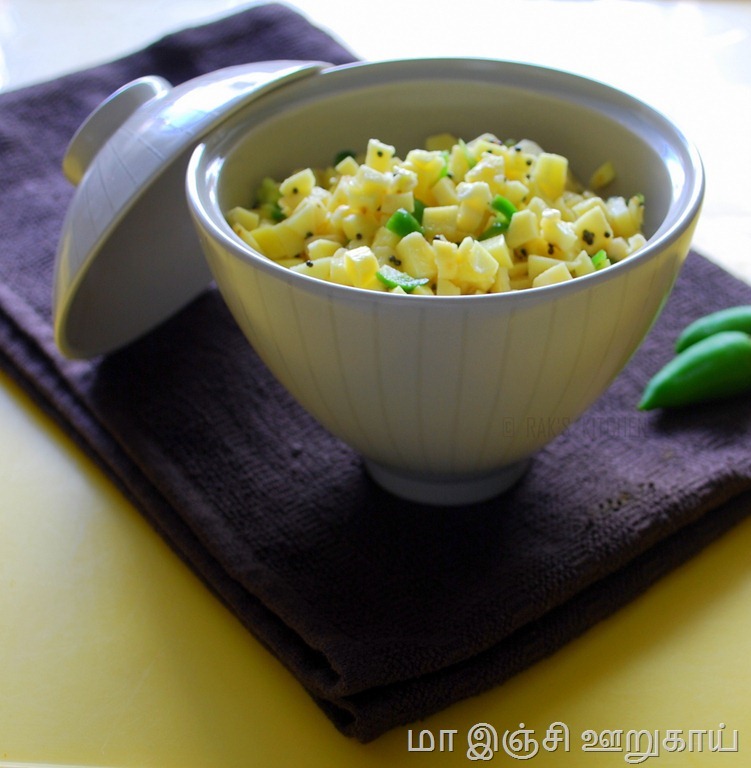 Happy Tamil new year….I too like mango Ginger I just make very small slices and mix with curd rice..my mom makes thokku out of it..
A very happy new year to you raks! its been a while, I know, but i was sick past these three months.I loved the pickle recipe. I was just looking at some of the ulundu vadai recipes and found a picture of yours in another website. I do not know if it is authorized by you. Anywayz,I thought I will let you know. A super simple pickle recipe! My mom makes something like this with lemons. Beautiful photos. I love both ginger & mango ginger! I am drooling. The picture are absolutely mouthwatering! beautiful looking pickle!….never can resist it!…very good recipe! Really tempting pickle… My mom prepare this almost the same way. Sure will buy this week and try it. My mom used to make it the other way like mango pickle.this looks absolute yum.happy new year to u .
I love maa inji and i have blogged another version long back! Ur quick version is quiet delicous! Mouthwatering pickle, looks very tempting and nice presentation! Tongue tickiling pickle Raks.. Goes good with curd rice..As u said, yeah, no smell in this ginger root, absolutely flavourful pickle..
Maa Inji looks awesome delicious. I am a ginger lover and maa inji is no exception naturally. The oorugai is simple yet delicious. I miss all of these varieties, this one, the young ginger they sell in Malaysia and such! Read comments from u in a number of blogs and finally thought of dropping in 🙂 Manga inji looks nice!!! So tongue tickling pickle..love it. Love manga inji, but missing it here. Looks so simple and delicious. looks simple and delicious dear…. i adore the flavour of maa-inji – i think it's a winning combination. Our favorite pickle is the ruchi brand mango ginger pickle.. I don't find maa-inji here or I could've tried your version. I love mangoes- raw or ripe. I love pickles. Need I say more? Oh yeah, that last picture makes me yearn for some raw mangoes to go make this simple yet tounge-tickling recipe. Bookmarked!